Over the last 5 years Terex Washing Systems has become an established supplier of advanced wet processing solutions for mineral washing needs in aggregates, recycling, industrial sands & mining. We now have an extensive product portfolio of rinsing, scrubbing and sand production systems available in static, modular and mobile platforms. We are committed to further expansion of the offering and our announcement at CONEXPO will demonstrate continued significant investment in product development which once again raises the bar in adding value to our customers operations. The FM120C-2-G consists of an 8m3 sump tank which receives the two slurries from the rinsing screen e.g. 0-2mm and 0-5mm. The sump tank is split and has 2 Linatex pumps which pump the slurry to two Hydrocyclones (Coarse 500mm (20”) Diameter and Fine 375mm(15”) Diameter. The Cyclones remove the unwanted material below 75 micron (200#) which is fed through the top of the cyclones to the Ponds/water treatment. The clean underflow is delivered to the 12’x5’ dewatering screen through a rubber lined underflow box. 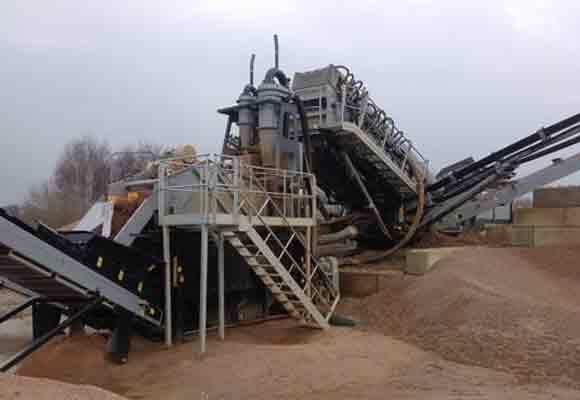 The high frequency dewatering screen produces 5g of energy via two vibrating motors. Standard polyurethane modules are Tema 500micron (35#). 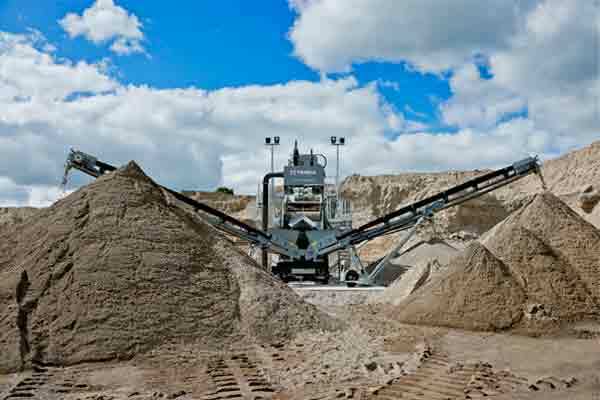 The FM120C has an integral blending chute which allows operators to divert some fine sand into the coarse to produce the desired product(s). The FM120C-2G like all TWS products is robustly designed & manufactured with a combination of rubber, ceramic and polyurethane wear protection. The FM120C-2G also has integral galvanised stairway and walkway to allow full access for serviceability. The TWS team looks forward to meeting with existing and new customers to showcase their innovative solutions and demonstrate how they can meet customers aggregate washing needs and demands.